This Grommet cannot be shipped to a PO Box. A street address is required. 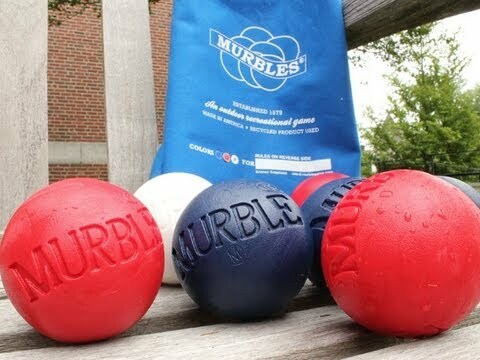 Murbles is a new outdoor game using large 3" in diameter balls (A Murble). Murbles can be played outside in the back yard, at the park, at the beach, etc. Obstacles such as tree roots, irregular surfaces, sand dunes, rocks, bushes, and trees make the game more exciting. Playing the game of Murbles requires no special skills and no special playing field. Anyone can play. Dimensions (in packaging): 9" x 8.5" x 3"
Well made product. I love bocce ball and this is very similar. Haven't got to try it out yet because all it's done is rain! This is my FOURTH purchase of these dice. I gifted 2 sets and our personal set was lost in a house fire in February. Obviously, I felt them worthy of replacing as our 2016 beach trip approaches. If you can’t beat ‘em, then why not make your own game? That’s what Murray Kramer did back in the late 1970s when he couldn’t win a game of horseshoes against his gentlemanly neighbor. A college student at the time, Murray created what are essentially giant marbles and devised a game that’s loosely based on bocce. Today, the all-ages game of Murbles is fun to play in any outdoor setting—at the beach, in your backyard, at a campsite, you name it. The rules are simple. One or two players on each team try to toss their Murbles closest to the point ball. Points are awarded in each round, and the first team to reach 10 points wins the set. The game winner is declared when a team takes two out of three sets. Murbles doesn’t require any special skills, it can be played on virtually any terrain (obstacles such as trees, rocks, and sand dunes just increase the excitement, Murray says), and it comes in a handy canvas carrying bag that’s easy to bring on vacation or to a get-together. The 3-inch game balls are made in America using recycled plastic material. If you want to spice up your summer games routine, try tossing Murbles. It’s easy to get addicted!